So, last week I published a blog Calculating a path from IoT GPS data on calculating the route using geospatial SQL based on data from SensorPhone app collected via IoT service of SAP Cloud Platform Neo environment and stored in SAP HANA. 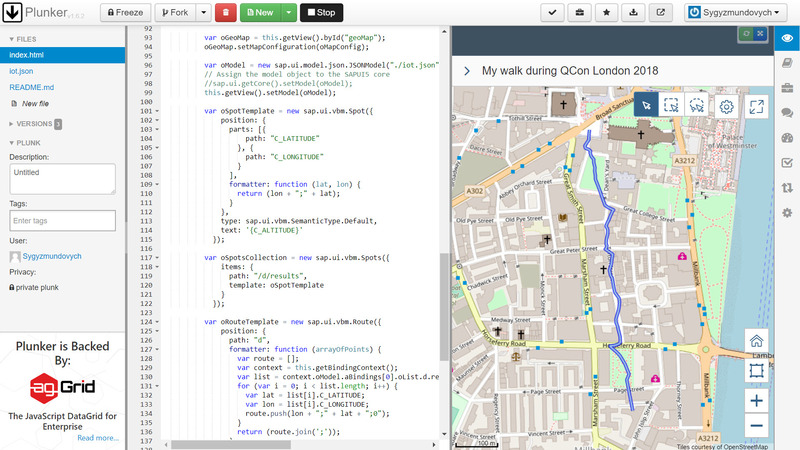 At the end I used an export to GeoJSON to visualize the path on the map using http://geojson.io service. First of all I needed access to that data set with GPS data points of my walk from a hotel to QCon conference in JSon format. Great news, IoT service in SCP Neo exposes it via OData 2.0 API. In my case I wanted data for the offline scenario, so I saved the output to file iot.json. You can find this file with data in the plunk (link above), if decide to experiment with this data as well. And that was it! I certainly recommend this openSAP course, if you haven’t started it yet! !